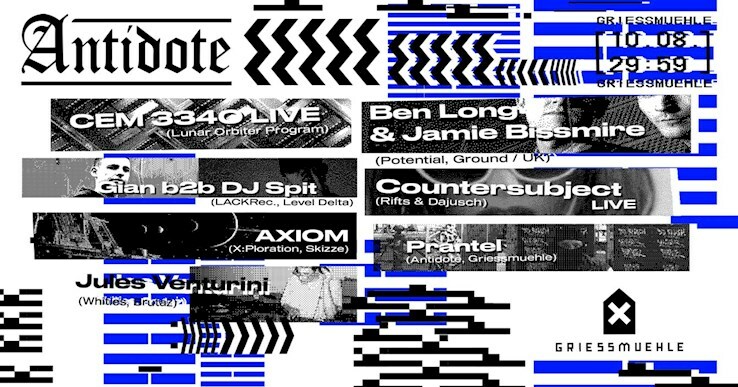 This event "Antidote" @ Griessmuehle has already ended on 08/10/2018. Here you can find upcoming events for this location! Antidote coming back at ya with the heat, this time inviting the dons of Hip-Hop style techno mixing Ben Long & Jamie Bissmire aka the last dj'z on earth aka Space DJz. Long & Bissmire will handle the Halle flanked by a live performance from newcomers Countersubject and our resident Prantel, while the silo will cater to electro heads with a live premiere of the mysterious up and coming Cem3340, LACKRec. 's Gian, who will close b2b with DJ Spit, Whities talent Jules Venturini & local electro head Axiom! This one‘s gonna take us all the way to Port Au Prince and back.